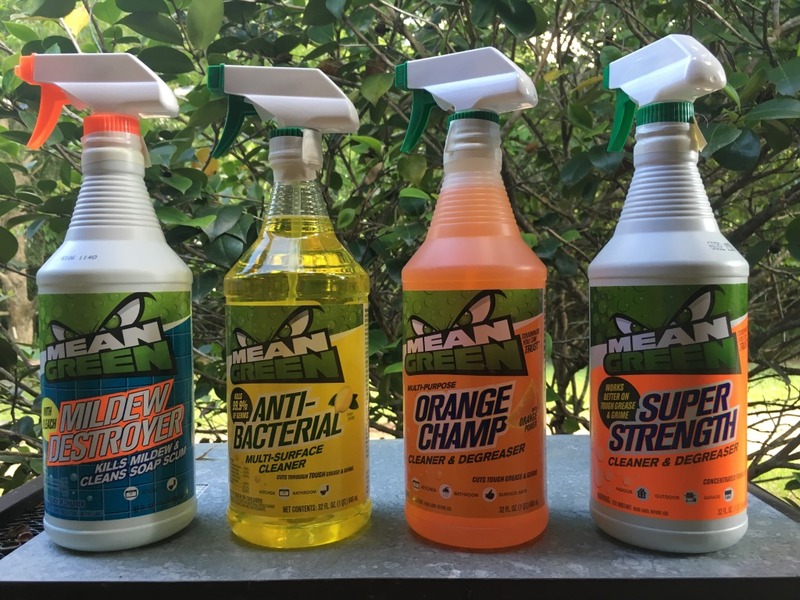 While I’ve always used and love Mean Green Mildew Destroyer and the Mean Green Super Strength Cleaner & Degreaser, I had never tried the Antibacterial or Orange Champ products. Mean Green Orange Champ really does work like a champ and it smells fabulous! Since finding out that Mean Green Anti-Bacterial kills most viruses and bacteria in ten minutes it’s all I plan to use in our bathrooms and kitchen. Here’s some more product info from the brand, or you can check out the Mean Green website. Mean Green Mildew Destroyer is a must have for cleaning and disinfecting areas with mildew and soap scum like the bathroom, kitchen, patio and more. Mildew Destroyer is a bleach-based cleaner and disinfectant. It destroys what is growing in dark, damp spaces. Mean Green Anti-Bacterial Multi-Surface Cleaner cuts through tough grease and grime while killing 99.9% of germs. Use in the kitchen, bathrooms and other household areas to clean, deodorize and disinfect the surfaces your family and pets touch every day. Mean Green Super Strength Cleaner & Degreaser is a powerful, multi-purpose cleaner and degreaser that can get grease out and eliminate grime from most surfaces. From fabric to concrete, Mean Green has been a trusted brand for more than 20 years. It is used to clean just about everything, inside and outside the home, business, garage, restaurant, work or hobby shop. Have you tried Mean Green cleaning products yet? Which is your favorite?